Habitat: Under rocks and in abandoned mouse borrows. Diet in the wild: Some might raid nests and eat young chicks, but mostly eat insects. Diet in the zoo: Insect diet- earthworms, meal worms, and crickets. Location in the Zoo: In the James R. Record Aquarium (Insect City) and in the Texas Wild Exhibit. Height: Approximately 2-3 inches high. Body length: Approximately 3-4 inches. Life Span: Females-40+ years, Males-15 years. Color: Light brown abdomen with dark brown legs. Females: Are larger than males, and have an abdomen about the size of a quarter. Tarantulas are solitary animals and can live up to 30 years. They are nocturnal hunters and are generally nonagressive. Moreover, they can live in burrows that are 2 feet deep. This species (Aphonopelma) has the longest life span of any other spider. Furthermore, most tarantulas are killed by predatory wasps called Tarantula hawks. The Tarantula hawks sting their prey and use the dead tarantula body to lay their eggs in. In addition, the offspring of the Tarantula hawks rely on the leftover body parts to supply them with food. Unlike other spiders, tarantulas use their silk to line their burrows instead of catching their prey. They have a pair of silk producing spinnerets located on the abdomen. Moreover, the female tarantula uses her silk to protect her delicate baby eggs. 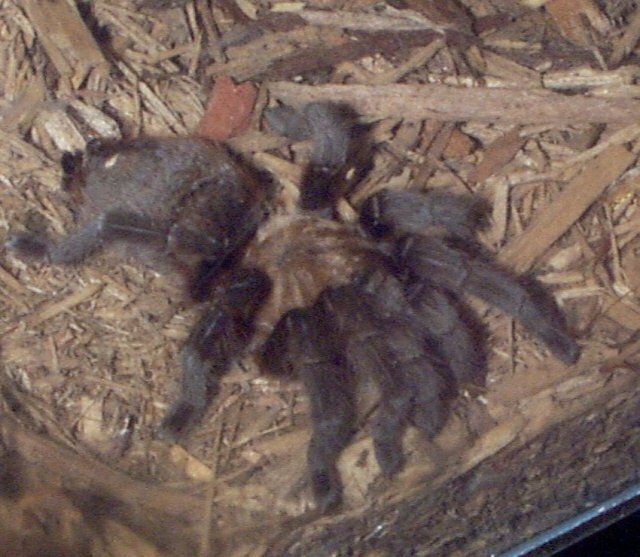 In addition, tarantulas shed their skins to adapt to their growing bodies. Comments about the two Tarantulas located at the Fort Worth Zoo: There are two tarantulas located at the Fort Worth Zoo. Both of them are Texas Tarantulas. They are on exhibit right now. Tarantulas are really not active creatures. The last couple of times I observed them they were still in the same position and the same exact place. Moreover, they usually have crickets running around in the bottom of the glass cage. 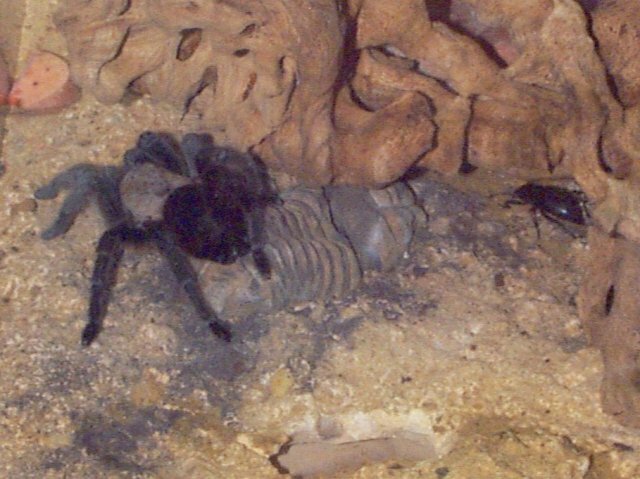 In addition, the tarantula located in the Texas Wild Exhibit has a glass cage that actually looks like it's located in a true underground burrow. Publishing. New York, New York, 1998. 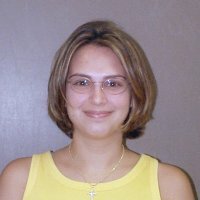 Inc.. Hauppauge, New York, 2001.